There’s one engine choice of a 1.8 litre petrol engine combined with 71bhp electric engine. Thanks to the instant power of the electric motor the Prius feels nippy and quick off the mark with smooth and constant acceleration. It takes just 10.6 seconds to go from 0-62mph and fuel return as you would expect is an astonishing 94.1mpg. Cornering is very stiff with hardly any lean and the Toyota Prius offers a far more refined drive than expected. The interior follows the future tech theme with a modern feel, like something from a science fiction film with plenty of lights, yet it’s all very clear to understand keeping you informed of what’s going on with the engines. Soft plastics help keep a more quality feel. There’s room for 5 passengers to relax. The central touchscreen infotainment system is very easy to use. 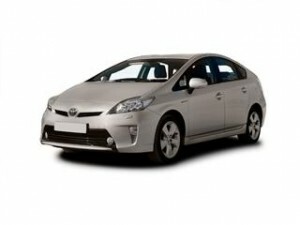 Owning your own environmentally friendly Toyota Prius could be easier than you thought. Don’t pay direct dealers prices. Talk to our highly trained staff here at Coast2Coast Cars you could save thousands of pounds. We scour the dealers for the best offers on your next new Toyota. There’s no charge and all it takes is a simple 2-minute form to build the car you desire and we do the rest. Finance is an option also subject to your status.